When I peered into my fridge to find inspiration for a last-minute birthday cake, I found a little bit of leftover vanilla frosting and a container of chocolate ganache. So I set out to recreate one of my favorite snacks: the black-and-white cookie. In cake form, of course. 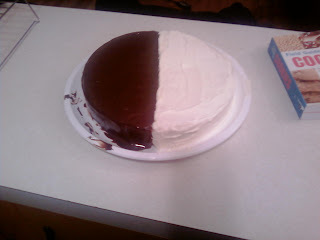 A couple months ago I used Paula Deen's 1,2,3,4 cake recipe, and converted the three-layer cake to a two layer one. This time, I needed even more math, to turn it into a one-layer dessert. 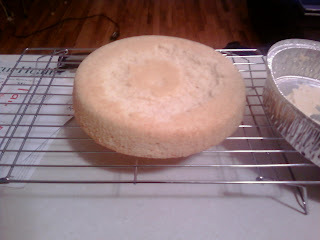 After I managed all my calculations, I baked up the cake in one 9-inch round pan. All was looking good, until I turned it over onto the cooling rack. Oh no! I'm missing some cake! Since I couldn't quite reattach this part of the cake...I just ate it. So I flipped the cake back over and hoped nobody would notice. After the cake had cooled to room temperature, I stuck it in the fridge for a few minutes to make it easier to frost. This way there would be less crumbs mixing with the frosting. 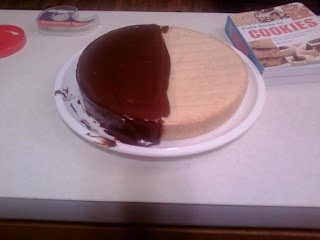 To create the black-and-white look, I placed a piece of scotch tape all the way down the center of the cake before starting the chocolate frosting. I microwaved the ganache for a few seconds before spreading so it covered the cake easily. After peeling off the tape, I went for the vanilla (also microwaved), this time a little more carefully without my tape guideline. 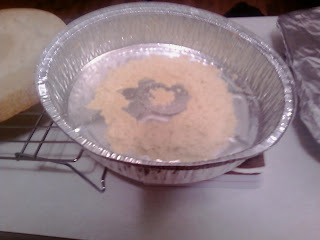 The only thing that was left then was to clean off the plate! 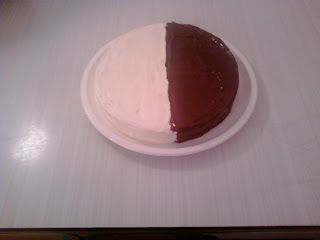 Black-and-White Cookie Cake - here I come! Tip of the Day: Use a damp paper towel or cloth to clean off the edge of a plate before serving (or photographing). If its just for you - or family - you can always use a finger!